Greetings to you, dear user of the iPhone (4, 5, 6) smartphone. 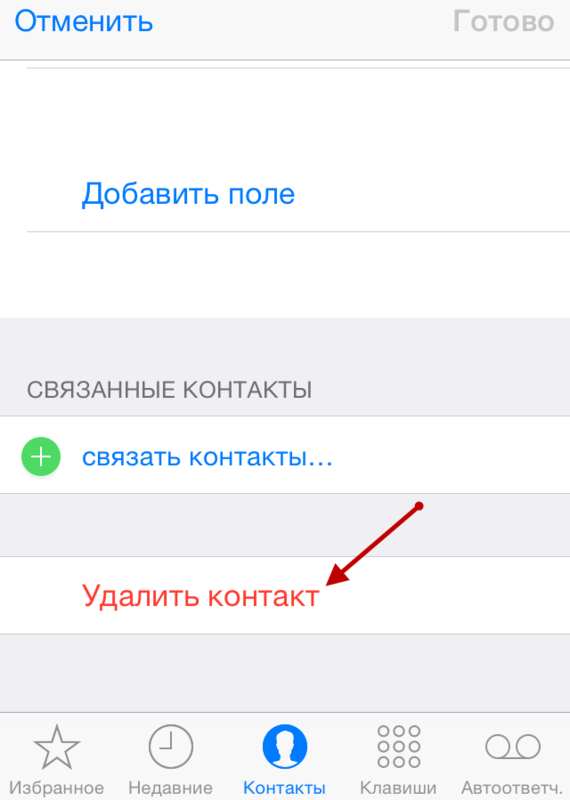 Today we will touch on a simple and at the same time interesting topic, I will tell you - how delete contacts with iphone. It seemed that it could be difficult to remove contacts from your iPhone mobile phone (4, 5, 6)? You are right - there is nothing difficult in this, but still some people have a similar question. Using the phone. Everything is very simple here. You do not need to install additional programs and connect your iPhone to a personal computer. Using iTunes. Using iTunes, you can either add contacts (sync with various programs installed on your personal computer) or delete them from your phone. If you need to delete ALL contacts from iPhone (4, 5, 6), then better use iTunes. So, go to the options for deleting contacts. Launch your iPhone and select the Phone app. Green icon with the image of the handset. Go to the "Contacts" section. Next, find the contact that you want to remove from the phone, click on it with your finger. The subscriber information panel opens. In the upper right corner, select "Edit". Go down to the bottom of the page and, to delete a contact, click the Delete Contact button. Using the above instructions, you can easily remove any contact from your iPhone. Below I will tell you how you can quickly get rid of all contacts in your smartphone immediately. Run the program iTunes and connect your iPhone (4, 5, 6) to your computer using a USB cable. After starting the program, select your device in the program’s side menu (if the menu is not visible, press CTRL + S). Go to the tab “Information” and put a tick in front of the item “Synchronize contacts with” and in the offered field select the necessary program. Press the button "Replace information". That's all for today, do not forget to share your opinion in the comments of this article..